Lurssen Mastering Console puts you at the controls in the studio with all of the secret tools, settings and techniques of world renowned multi-Grammy Award winning mastering engineer Gavin Lurssen and his team. Now you can master your music on the go on your iPad and get the professional, Grammy award-winning sound that the studio is known for. Pop, rock, hip-hop and more, Lurssen Mastering Console can help you achieve amazing mastering results when a trip to Los Angeles just isn’t in the budget. 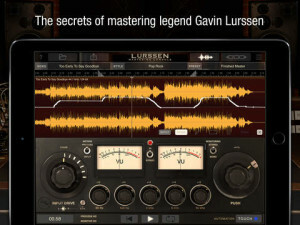 Lurssen Mastering Console is a totally unique and new approach to digital audio mastering. It’s designed to help you capture the magic of the Lurssen Mastering studio’s entire mastering audio processing philosophy. Instead of giving you just a collection of individual processors and presets, Lurssen Mastering Console provides you with models of the complete mastering gear processor chain as a whole. The interactions between the individual processors have been digitally recreated which recreates the synergistic “whole is greater than the sum of its parts” sound that has earned Gavin and Lurssen Mastering multiple Grammys. With Lurssen Mastering Console, you have automatic access to a lifetime’s worth of professional audio mastering experience. It helps you quickly get great sounding results thanks to its 20 pre-made “Styles” templates, which have been created and optimized by Gavin Lurssen, mastering engineer Reuben Cohen and the rest of the team. These templates reflect decades of combined mastering experience and fit a broad range of musical genres. Using Lurssen Mastering couldn’t be easier: Just create a project, load a song, then select an appropriate “Style” from the drop-down menu. Take control via an Input Drive knob and a five band EQ as well as a “PUSH” knob, which lets you subtly and uniformly nudge the EQs so you can “ride” the flow of the song and add that special Lurssen “magic” to your music. You can view and automate changes to the two knobs by using the waveform display with three different automation modes. You can make adjustments to EQ settings and save those as presets for easy recall — a preset consists of a style plus your adjustments. 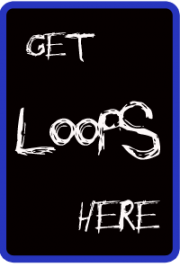 You can also view the physical gear chain and make subtle adjustments via the Chain view. When you’ve finished your mastering work, you can export your song to File Sharing, SoundCloud and more in a variety of popular file formats for final distribution and delivery. 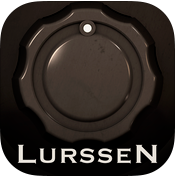 With the Lurssen Mastering Console you can easily master audio with your iPad while on the go.